Known from coast to coast, especially where the climate is balmy, Mockingbirds are one of the most varied of all songsters. It takes an expert to distinguish between the mocker's original melodies and his imitations, but some listeners have recorded as many as eighty-seven imitations of other sounds in seven minutes, all repeated four or five times. One Mockingbird joined a National Symphony Orchestra during an outdoor concert and imitated the flute which imitated the bird calls in "Peter and the Wolf." The exquisite fragrance of this waxy, white flower, so rich in romantic association, is reason enough for its being Florida's contribution to the national garland. 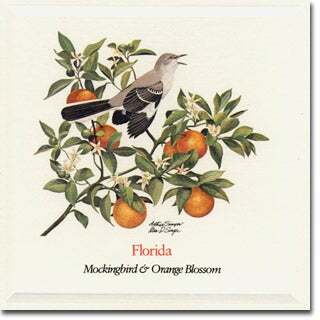 Among other distinctions, the Orange Blossom is the only state flower from which a perfume is commercially produced. Growing on a low-branching evergreen tree which seldom grows more than thirty-feet high, the blossoms usually have five petals and attract the bees whose honey is of a very distinct and delicious flavor. 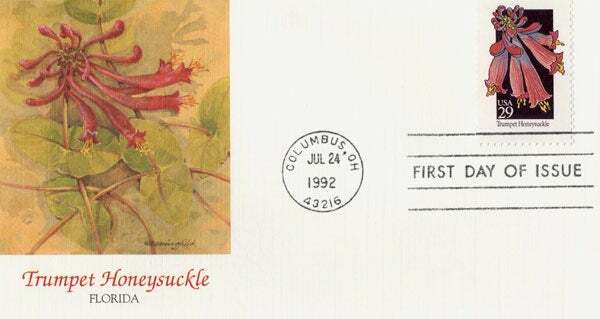 Florida Wildflower - Trumpet Honeysuckle Art from the 50-stamp series, State Birds and Flowers, issued April 14, 1982 simultaneously in all state capitals.